We are world leaders in the design, engineering and installation of ground anchors that improve the stability of dams. Our large-scale ground anchors are helping to secure major water reservoirs around the world. Our anchor technology has been developed over 50 years leading the industry in design and installation techniques, and SRG Global holds the world record for the largest anchors ever installed. Our anchors are fabricated onsite using techniques to ensure the highest quality. Our plant and equipment is bespoke, designed and manufactured to unique specifications to provide safety, quality and productivity. 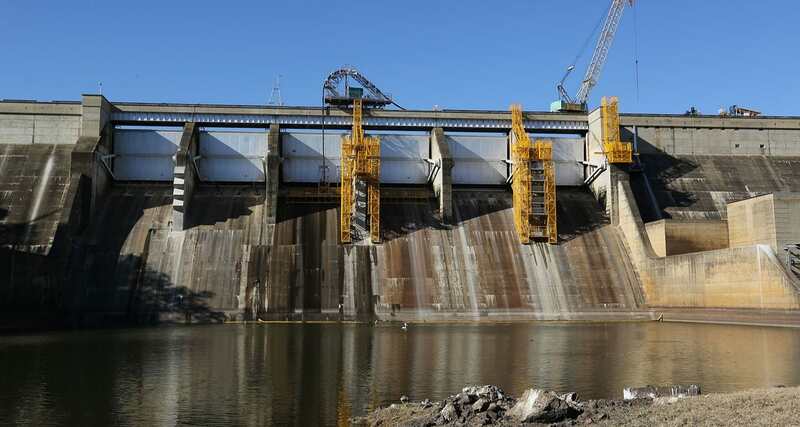 Our dam teams are skilled not only in anchor installation but can combine anchoring with other support technologies such as specialist access systems and slipform techniques, to further enhance our capabilities in this sector. Our offering extends to precision monitoring and dam maintenance, providing the full engineer, construct, sustain solution for dam asset security. SRG Global are world leaders in dam anchoring with a proud and extensive history having completed projects throughout Australia, New Zealand, South Africa and Sudan. We have developed in-house the highest capacity permanent anchors and longest anchors ever installed in dam structures. Our proven success is a result of our technology and its continual development which enables SRG Global to provide a tailor made solution for every project, be it anchors of modest or extreme capacity. The design and installation of anchoring systems requires a high level of diligence if premature failure is to be avoided. Equally vital is testing and monitoring of any anchor system both before and after it enters service. SRG Global provide bespoke load cells for monitoring anchors to ensure effective performance throughout the life of the anchor. SRG Global manufacture all anchors for dam strengtheing projects in-house. Depending on the size of the project most anchors will be manufactured on site and transported via specialised equipment to the final install location reducing logistical issues and transport costs. SRG Global has developed a robust corrosion protection method which is unsurpassed and ensures life expectancy of anchors is optimised.